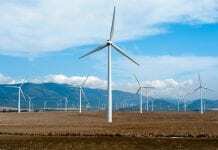 SPAIN’S greenhouse gas emissions have dropped almost 25% on last year, the country’s grid operator reports, as the levels of wind and hydro generation increased dramatically. 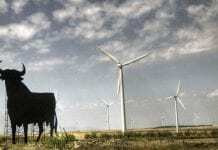 Red Eléctrica de España (REE) released a preliminary report on the country’s power generation, which revealed for “the first time ever, [wind power] contributed most to the annual electricity demand coverage”. Wind turbines contributed 21.1% of electricity demand on the Spanish peninsula, just outdoing the country’s nuclear reactors, which provided 21%. Wind power and hydroelectric power production soared this year, increasing by 12% and 16%, respectively. Throughout the year the all-time highs of wind power production were exceeded. On February 6th wind power recorded a new maximum of instantaneous power with 17,056MW (2.5% up on the previous record) and that same day the all-time maximum for hourly energy was also exceeded reaching 16,918MWh. 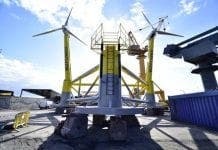 Furthermore, in January, February, March and November wind power generation was the technology that made the largest contribution towards the total energy production of the system. An increase in capacity of wind power (173 MW) as well as solar PV (140 MW) and thermal (300 MW) meant that at the end of 2013 renewables accounted for 49.1% of total power capacity in Spain. This news, coupled with the reduced out put of gas plants (down by 34.2%), coal plants (27.3%) and nuclear (8.3%) has pushed the country more and more towards a 100% renewable future. Next articleMadrid: Food Capital of Spain 2014? Renewable energy is a far better solution to energy supply than harmful ‘fracking’ and generates jobs in Andalucía. Come on, you climate change deniers, doubters and lovers of carbon and uranium. Let’s see you refute this report. It makes a change to see Spain do something right. More please! Well they are effectively banning solar pv to help out Endesa, Iberdrola etc, so it seems that the reduction in emissions is not the result of deliberate policy. The last Spanish Government introduced subsidies of 44 cents per Kilowatt Hour GUARANTEED for 25 YEARS for renewable energy, when the wholesale price of electricity was 4 cents per KwH. At this, every man and his granny seem to have set up a solar or wind farm, and have been coining it in hand-over-fist. As we can see from the report, the policy has been a spectacular success, but it has left the current government with obligations to pay taxpayer subsidies of $126 billion and rising. Forced with having to make cuts everywhere to it’s budget, the current government is trying to claw back some of the profits being made out of the taxpayer by the renewables companies by way of tax. This is what is being called “taxing the sun” in some quarters, and “effectively banning solar PV” in others. This, of course, doesn’t affect people with solar panels on the roof in Spain as they can’t sell surplus energy back to the grid.